I have never read a single Agatha Christie book, nor could I recall having seen a single movie or T.V. show based on her work until I started doing supplementary research on this movie (call me unenlightened). This is a shocking statement, I know, but it gave me the advantage of reviewing this film tabula rasa, unencumbered by preconceived notions or expectations from the books or previous adaptations. My resulting enlightenment resonated with the sentiment, “Meh…not bad.” The story follows one Hercule Poirot, a world-famous detective who is well into his career and now looking for some rest and relaxation. Despite Poirot’s best efforts, he becomes embroiled in perhaps his most difficult case yet, confined to the snowbound Orient Express. In this film, Kenneth Branagh serves as producer, director, and star as Christie’s famous detective protagonist. The movie was shot on real film stock and looks gorgeous. The colors are all distinct and vibrant, but I can’t help but feel that, like Tarantino’s The Hateful Eight (also shot on 65mm film), the extra production effort and expense is wasted since most of the movie takes place inside the cars of a train. 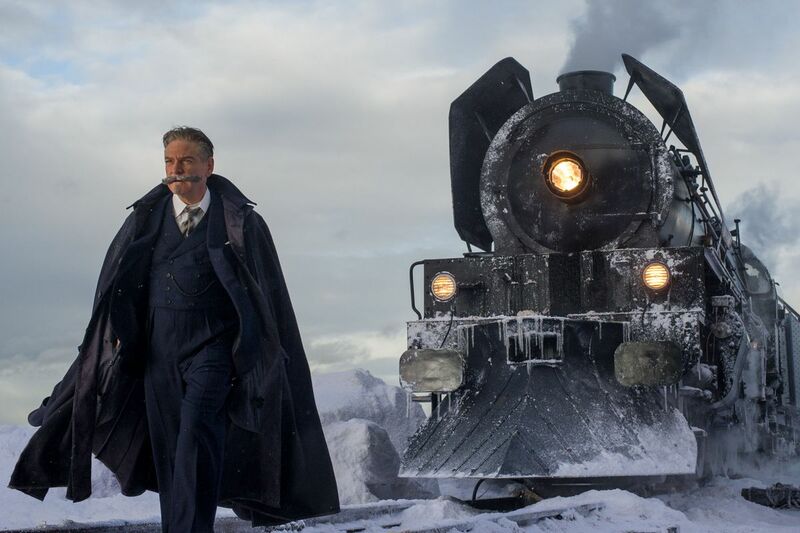 The film struggles to keep up the tension because the passengers are snowbound on the Orient Express and it really seems like Poirot has all the time in the world to figure out the case rather than work under the artificial ticking clock imposed by the film. Additionally, the pacing is off, and the film occasionally tries to keep interest through a chase scene or violent outburst in an attempt at classic misdirection, but really this is a dialogue-heavy plot that elicits its audiences’ entertainment by inviting viewers to solve the mystery themselves while Poirot teases out hints and clues. Branagh’s portrayal of Poirot is the best thing about the movie, and Branagh, to my untrained American ears, nails his Walloon accent. Poirot is an eccentric super-detective with a preternatural ability to solve crimes. Unsurprisingly, his character gets the most attention and screen time. Unfortunately, the film is weaker because of its intense focus on Poirot and only Poirot. The film is more a self-indulgent Kenneth Branagh vehicle than a fantastic murder mystery, despite the obvious reverence Branagh has for Christie’s original source material. Without wishing to spoil the mystery, I can’t elaborate on some of the more specific issues I had with this story. Suffice to say, there are several plot holes and an awful amount of coincidences, but the film does elicit satisfaction once Poirot solves the case. The casting of Murder on the Orient Express is its main strength. This is a film that has Daisy Ridley as the tenth top-billed actor of the main cast and Johnny Depp in it, for all of fifteen minutes. I mean that’s some serious marketing luxury. The film, sadly, squanders its massive talent pool. Branagh only focuses on these supporting characters in brief scenes, or whenever Poirot is interrogating them. Thus, the only time we get to know the supporting cast is when they are being grilled by Poirot about the murder. These actors hardly interact with one another on camera, and they are unable to give much, if any, depth to their characters, despite the strength of the cast. The film allows no emotional investment of its characters (besides Poirot), and none of them really “stand-out” as a believable culprit or even red herring. The film is more interested in the making the mystery a Gordian knot despite several glaring contrivances. Murder on the Orient Express will keep you interested but that’s about all it will do. Despite the pedigree of the source narrative’s history and the film’s stellar cast, the movie is only mediocre but entertaining. It’s clearly evident that Branagh really cares about the mystery and the character of Poirot. This narrow and intense focus means that Poirot is the only character that gets any significant depth, which is a major directing error and a disappointment, given the talent present. Ultimately, the film is alright, but there are better options available. TLDR: Murder on The Orient Express is a self-indulgent film from Kenneth Branagh, saved by its extravagant cast. 3/5 Stars.